Start the barbecue, if using, or preheat the oven grill to high. Toss the vegetables in 1 tbsp olive oil and, in 2 batches, barbecue over hot coals covered in a light layer of ash, or grill on a baking sheet, for 3–4 minutes each side, until charred and cooked through. Put in a large bowl. 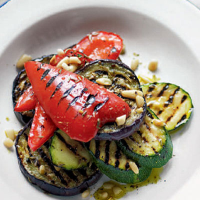 Combine the honey, cumin seeds and remaining 2 tbsp olive oil, then toss into the grilled vegetables. Scatter with the pine nuts. Barbecue or grill the pittas. Mix the yogurt, lemon juice and harissa to make a dressing. Serve with the vegetables and pittas.